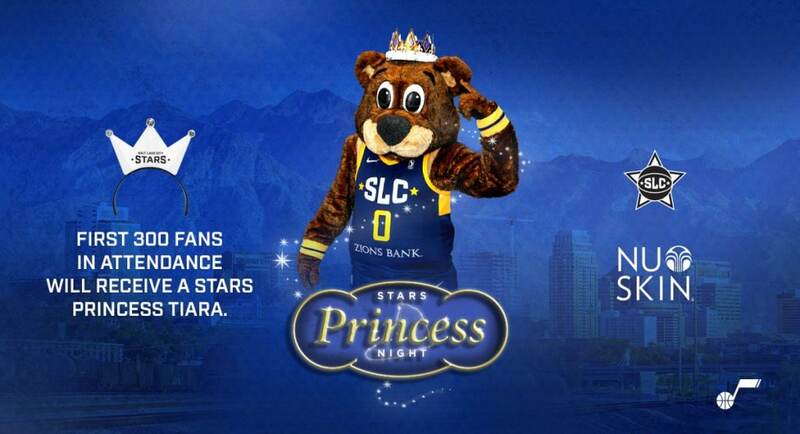 The Salt Lake City Stars, the NBA G League affiliate of the Utah Jazz, will host Princess Night presented by Nu Skin on Saturday, December 15 when the team faces the Stockton Kings. Doors to Bruin Arena on the campus of Salt Lake Community College in Taylorsville will open at 6 p.m. Tipoff is at 7 p.m.
First 300 fans in attendance will receive a Stars Princess Tiara. They are also encouraged to dress up in their favorite princess costume. Elsa, Moana, Belle and Cinderella will be in attendance to take photos with fans. Other activities for the night will include inflatables, pop-a-shot, face painters and balloon artists in the Kids Zone, presented by University of Utah Health, as well as appearances by the Stars Stunt Team and Buster.